Product #45576 | SKU KOMODOK5 | 0.0 (no ratings yet) Thanks for your rating! Constructed from aircraft-grade aluminium alloy, the Komodo K5 Fluid Head from iFootage is durable, compact, easy to carry. The entire main body is smooth to the touch and is protected from corrosion and wear through anodic oxidation treatment. The main body also has an easy-accessible integrated bulls eye spirit level, allowing you to quickly cheque important verticals and horizontals. With standard 3/8" mount, it is suitable for all tripods and monopods. The built-in patented high-precision bearing mechanism and original designed bearing mechanism ensures smoothness of camera movement. 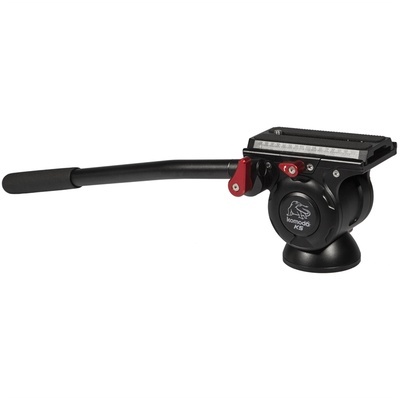 The tilt and pan movements are smooth and can be quickly locked off and on, thanks to iFootage's patented fluid-head design. The quick release camera plate attachment and locking system is easy to use. The camera safety lock quickly locks the camera plate to the head.